Blue Cohosh For Sale Online. Fast Shipping! Order Now. The Blue Cohosh is a squall root. 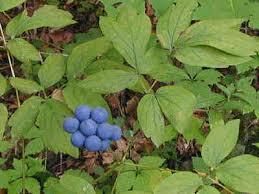 The Blue Cohosh was used for many centuries by Native Americans as a beneficial herb. It is a perennial that produces fruit very similar in appearance to blueberries. The Blue Cohosh has beautiful blue-green foliage and grows from a stalk. It also features tulip-shaped leaves at its base. The Blue Cohosh makes a lovely addition to any garden or lawn, and it likes to grow in little clumps where it has been planted. It does very well in both plant pots or as an indoor plant. Blue Cohosh looks very exquisite in a shade garden, and since it is a perennial, it will come back every spring. Cohosh will typically bloom in April and bloom through June. It will grow great in almost any types of soil conditions. Blue Cohosh is a member of the buttercup family. This wildflower is excellent for natural areas. It can bring large amounts of color to the city as it is tall and the flower stands erect on the ends and is fully allowing it to show a lot of colors. Blue Cohosh is an excellent plant for your yard. It has a bright blue color and beautiful little blooms. They will make your yard look so pretty. They would look great in natural areas or near a pond. The leaves are a gorgeous green color. They have a leathery feel to them with a rigidity edge. They are beautiful in looks but have a different foliage appearance when you see them closely. This perennial loves the fertile loamy soil and does best when it has fertilizer. The bright blooms are seen in late spring and early summer. The flowers are colored blue and stand out among the green leaves. Add this plant with green foliage and see what happens!